Johnson goes on urban stroller expeditions, seeking beauty and wonder in the commonplace. The father and daughter (with mom’s blessing) become Thoreaus of the concrete, studying pigeons, snails, crows and squirrels, and foraging for tangy sidewalk weeds. 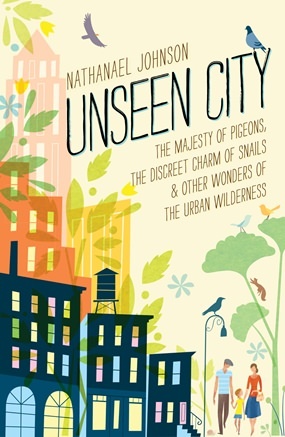 The author writes beautifully about the various city critters, and also captures the magic of a young girl growing up and viewing the world with fresh eyes and wonder. Josephine moves beyond “that?” to exclaim “whoa” at the sight of young fruit buds, and soon sees details her father missed, like the beautiful green sheen on a pigeon’s neck.